Rival’s As the Reels Turn is the first in a series of Rival’s interactive iSlot games. 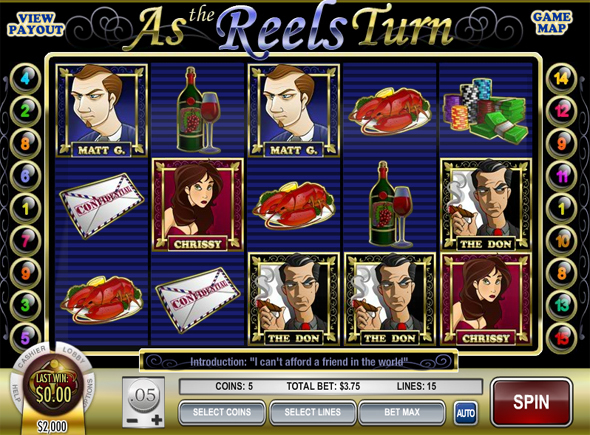 Boasting five reels, fifteen pay lines, and a story line that changes based on the player’s success (or lack thereof!) As the Reels Turn offers a fresh slots experience for everyone from the most timid gamblers (players can bet as little as a penny for a chance at $10.00) to people looking for big bucks – activate all the pay lines and bet $2.50 on each one for a chance to win the $2,500 top jackpot! Real high-stakes players have the opportunity to win $5,000 (if they spin all five El Paradiso symbols) or even $7,500 (if they hit the jackpot with a 3X multiplier). 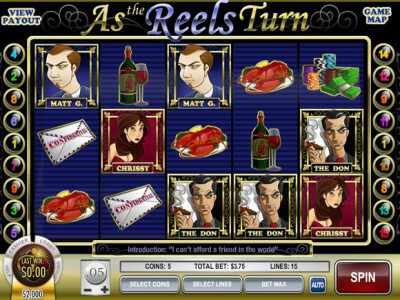 Rival’s iSlots games are the only story-based slot-machines, and As the Reels Turn is no exception. Throughout the game, players will be introduced to a set of quirky characters including Tommy Wong and Ivan the Fish, just to name a few. As certain lucky scenarios occur (i.e., the player lines up three Scatter Symbols) the story will advance with cut scenes and bonus rounds with special interactive games becoming available. Make sure to increase your chances of moving the story forward as well as winning the big bucks by activating and betting on all fifteen pay lines; this raises your chances of winning with multipliers on your free spins. Have fun when you check out As the Reels Turn, and above all, good luck!